January 2018, Geneva – Frederique Constant presents its first novelty of 2018, a redesigned Classic Worldtimer Manufacture featuring a new green color pattern. Nowadays, Time could be considered just as precious as gold. For the busy businessman travelling around the world, keeping track of time locally and at home is primordial. 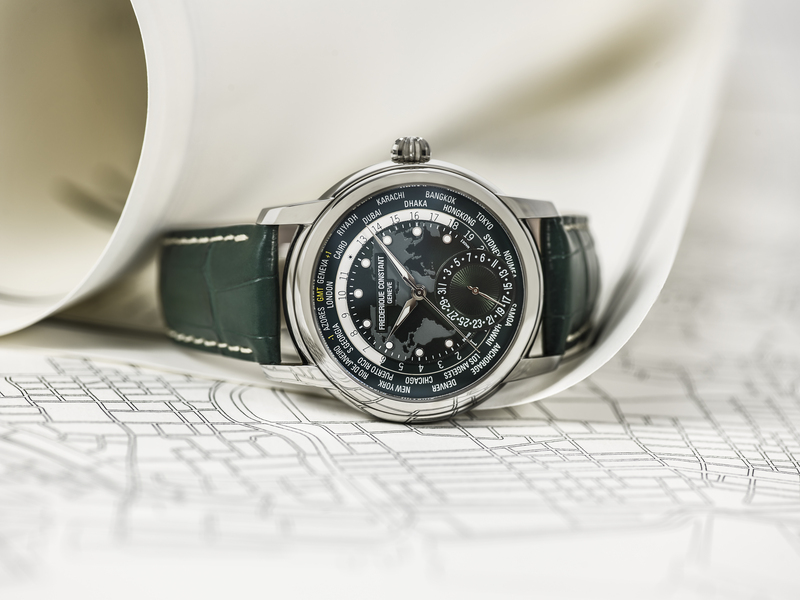 With the new Classic Wordtimer Manufacture, you will be able to track time throughout twenty-four cities worldwide. Frederique Constant is a watch manufacturer based in Plan-les-Ouates, Geneva, Switzerland. The company is involved in all stages of watch production, from initial design, to final assembly and quality control. Frederique Constant develops, manufactures, and assembles in-house calibers, 24 different versions since 2004. In 2015 Frederique Constant introduced the first Swiss made Horological Smartwatch, powered by MMT SwissConnect and entirely displayed with an analog dial, thereby creating an entirely new watch category in the Swiss watch industry. Frederique Constant watches are defined by their high quality and differentiation and precision in design and manufacturing. Their perceived value, through quality of design, materials, and manufacture, is a key component of their success. Each watch is assembled by hand, with the latest equipment and extensive controls, to ensure maximum quality and durability. The company embraces innovation to offer creativity and exceptional value. Its 32,000 square foot facility in Geneva is ultra-modern and offers the best environment for its passionate watchmakers. A finely world map was etched on the dial and the twenty-four cities are placed on its outer rim just as previous editions. The date by hand is located at 6 o’clock and perfectly fits within the dial. Telling time on this newest timepiece will make keeping time a relaxing and simple experience. The FC-718 caliber movement is an extraordinary piece of machinery not only because it is in-house designed, developed and produced but also because its Worldtimer functions as well as the date are all adjustable via the crown itself, with no additional push-buttons. Frederique Constant was the first to announce such an accomplishment and three Worldtimer editions later this innovation is one of the top selling arguments for this watch. To easily set the functions you must choose between three settings; the first lets you wind the watch by turning the crown upwards; the second allows the user to set the date and city by turning the crown upwards and downwards, respectively; and the third position allows the user to set the time by turning the crown downwards. This timepiece displays two separate discs, one featuring a 24h day-night indicator and a second one with the twenty-four cities. As a Manufacture movement, the FC-718 caliber is decorated with Perlages and Côtes de Genève, and holds a 42-hour power reserve. The green timepiece is complete with a green alligator strap with white stitches. With yet another revival of the Classic Worldtimer Manufacture, Frederique Constant continues to enhance its Manufacture collection. Always mindful of the “Accessible Luxury” philosophy it implemented the brand strikes again with an in-house movement for under 3500 CHF. Previous articleIs Happiness A Country Trait?